I've been very anxious to feature a very special female in my life, Katie Dawers. This young lady has come incredibly far and superseded all of her expectations by a long shot. On behalf of everyone, including myself, who has trained with her, watched her grow, we are truly so proud of you Katie! Don't ever quit! Dedication, determination, and smart training pays off, as you have proved to yourself and the world! Read her story below. Hope you are all as inspired as much as we continue to be. Everyone has a story. Some people’s life stories are sad, some of them are exciting, some are boring and some are inspiring. With my story I hope to inspire everyone from all walks of life. I wont bore you with my childhood journey into adult hood, instead I will start where life really happened, and I mean this in the most literal way possible, when I got pregnant with my son. ​When I found out I was pregnant with my son I was 18 years old. I had many unhealthy habits. I smoked a pack to two packs a day. Caffeine was my best friend, as I would drink the large Red Bulls several times a day, on my minimal caffeine day it was coffee and two large Red Bulls. It doesn't stop there. My diet consisted of a bagel or croissant for breakfast, I ate lunch at Jack in the Box and dinner at Carls Jr. Back then I worked for a lawyer and we would take breaks and smoke cigarettes and drink coffee and I loved it! It made me happy. Receiving the news of being pregnant I was in major shock and definitely not ready to make any life changes. I found out I was pregnant really early, only about 4 weeks and my ultrasound showed only an egg. After my sonogram I went home and smoked a cigarette, considering this is what I had done to cope for the last 4 years of my life. After the shock I quit smoking and quit the caffeine as much as I could, I still had my one-cup of coffee every single day. Through out my pregnancy my wonderful husband talked me into walking every day, and so I did. However, I walked maybe half a mile a day if that. Even though I made big steps (for who I was back then) my diet was not that much better. I would eat pizza with a bag of carrots. I did always try to eat something good. I didn't have any money then so I lived off tuna helper and broccoli. The meals were cheap and I was saving for my baby. I didn’t know then that the most important thing was the health of my baby. After a long pregnancy Cole was finally born. I fell in love with this little boy. I have never loved anything more in my life. But this love was not enough, this little boy never slept (he still never sleeps) he’s just not a sleeper. I became a little depressed. I had a little post partum depression and when that wore off I was still depressed. I remember visiting my mother. My mother told me I was depressed from not sleeping. While I nursed my new born, she continued to tell me I needed to join a group that had other mothers to support me. Well my mother had just had a baby herself, my little sister Ava she was about 2 when Cole was born. My mother did stroller strides back then and so I joined. 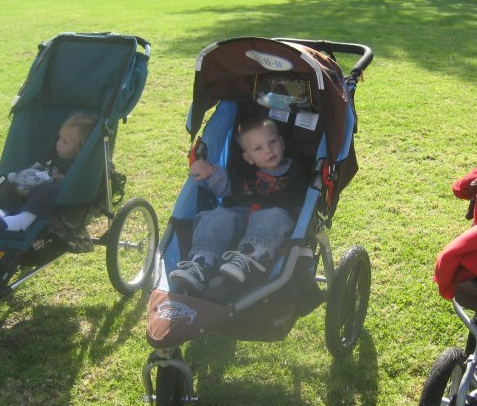 In stroller strides we ran a quarter mile stopped and used some bands for strength. I was dying. I couldn’t run nor use the bands. As hard as it was I kept going, it got me out of the house and at the time I lived 45 minutes from my mom so I got to see her twice a week. My husband is a Marine and had to deploy when my son was 7 months old. I was 45 minutes from my mom and alone with a seven month old baby. Working out got me through the seven months of my life. It quickly became my release. While this is terrific most would say, I also began drinking wine, every night while my husband was gone. It got me through the lonely nights. I felt like I never got a break and never had a baby sitter. I hung out with my mom a lot and spent my first month living at my moms house, I was so lost. Drinking helped and when my husband returned the drinking never stopped it became a habit and a bad one. About a year or so after I started stroller strides, my mother Della Whelchel and Lauren Brooks decided to start a kid friendly class using kettlebells and strollers (Buggybellz). I was excited for my mom, however kettlebells were really intimidating for me. As their first class approached I went early with my mom. She was trying to show me a few tips and moves with the kettlebells before other mothers arrived. Anyone that does kettlebells knows that we start everyone with an 8kg (18lbs). My mother says to me “press it”. First of all I didn’t even know what a “press” was nor was I sure I wanted to. The swing was enough to overwhelm me and the class has not even started yet. While my mother was showing me how to press it ever so gracefully, she handed me the bell and I begin to press it. Lets put it this way, it was very ugly and the bell never made it past my shoulders. I was weak. This was hard for me as in the stroller strides classes I felt I grew stronger. As my life started to change so did my attitude. Kettlebells were very intimidating for the first six months or so. I remember thinking how strong Lauren and my mom were, I thought, “I will never be like that, I couldn’t, I will just stay where I am physically, I cant even imagine being that strong.” As I attended these classes regularly three days a week I eventually got my form down. I had the best support, my mom. We would practice at her house and talk about it all the time. My mom taught me almost everything I needed to know to get through the days with my baby to how to swing a 16kg kettlebell. Going into these classes I remember how flabby my stomach was, I hated it. I had rolls; my arms were flabby and weak. In my first year of learning kettlebells this slowly but surely started to change and so did my eating habits. I began to follow my mother. We would talk about diet a lot as she is and was into health. I still didn’t eat that well though; I would still have pizza every once in a while and hit a fast food joint. My drinking was probably worse then ever at this point. I remained pretty mellow while drinking; it wasn’t like I was a raging alcoholic, or violent, if you didn’t know me you might not even know I have had something to drink. As time went on my mom and Lauren allowed me to teach a Buggybellz class for them once a week after receiving my HKC (Hardstyle Kettlebell Certification). This is around the same time I took one of Laurens classes at her in home gym. She encouraged everyone to pick up a bell that they have never pressed before after a series of progressions. The biggest bell I ever used before at that time was a 16kg. So I picked up the 20kg I racked it and I pressed it. I think this was the first time I realized I could be as strong as my mentors. I had to figure out how to do this. Buggybellz wasn’t going to work. I couldn’t carry heavy enough bells in my stroller nor afford them. I really had to think about this. I began taking Lauren's classes once a week. Lauren did heavy snatches in class and I snatched the 20kg, I felt like I was on fire. After time Lauren and I started talking about me teaching for her. I became RKC, Russian Kettlebell Certified, my confidence really started to grow. I felt better than I ever have in my life and I had such great people supporting me. I felt like going into Lauren's classes I wanted to be better, as if what I was doing wasn’t enough and I found a way, I just figured it out. I grew to be really strong and confident. I got compliments on my body more than ever actually for the first time ever! I had this fire in me (I still do) to do something, to be something great; I didn’t want to settle for less. There was more out there, there had to be. I had a dear friend, make a phone call to a mainstream fitness photographer. I sent him some pictures and he said he would throw me in the “hopper”. Well these “mainstream” guys they get busy, my friend and I kept calling him and emailing and eventually he did a shoot with me for Compax. I went down to his studio with butterflies in my stomach I probably could have vomited. Luckily he was a really cool down to earth guy. I spent hours at his studio and when I left I never felt more alive. I had a rush and I wanted that to be my life. I had to figure that out too. While this was all a slow process I kept in touch with the photographer, and I tried signing with different agencies. I got really into my training, I got really strong and I was going to Lauren's classes 3 days a week and teaching one day a week. My life has officially changed since the day I found out I was pregnant. I cut down on my meat tremendously; in fact I even dabbled with being vegan. I now only eat grass-fed organic meat, I only eat organic veggies, and I no longer use drinking as a release. I have a glass of wine or two on occasions. I don't eat any dairy and I make my own nut milks. I have a garden in my back yard. I don't eat fast food but of course we have to live and I will have dark chocolate or nut brownies once in a while ;) I do not drink coffee or any other caffeine (unless it’s a special treat of course). I am now able to press a 24 kg, pull up with a 12kg, single leg dead lift 2 32kg’s, swing my body weight and much more. I will never stop doing kettlebells I will never stop training it has truly changed my life. I now have a few shoots under my belt in fitness; you can find me on the cover of 3/GO magazine, in My Mad Methods Magazine, in Nuun, Compax, etc. I have signed with a fitness agency in LA, and am signing with a fashion agency as well. I now train at On The Edge Fitness with Lauren Brooks, all while continuing to go to college, raise my beautiful son, and hold my marriage together. My life has forever changed. I will continue to grow and evolve. I will continue to motivate myself and always strive to be better as everyone always should. Living outside my comfort zone as much as I can. If there is anything I would want someone to take away from this story it would be that just because you are someone you may not be proud of today, does not mean you have to be that person tomorrow. You can be whomever you want. Though, it is not an easy road, you are not stuck and you have a choice, you have to want to change. There is hope and it only takes one step at a time. Take one step and never look back! Thank you Katie for sharing your journey from unhealthy to super woman. You have only just begun and I truly look forward to your continued road to optimal living. I'm honored to have been a part of your life change experience and look forward to witnessing your incredible success! what a wonderful story!! Thank you for sharing it with us! definitely a fantastic story to illustrate how getting healthy can impact so many things! What a fantastic story and achievements! I wished many people could read it and take action. wow, thanx for sharing. I know what i need to do, you are an inspiration. Truly inspiring!!! Congratulations on overcoming all your obstacles ! You loook absolutely amazing ! Kaite, You are brave, strong, and beautiful. It was so healing to read your story because we are both women who have come from a place of despair to a place of power. I, like you, am lucky to have met Lauren, along the way, and now I know I feel blessed that I know you too. I am so glad we can kettlebell together! Katie, you are brave, strong, and beautiful. It was so healing to read your story because we are both women who have come from a place of despair to one of power. I, like you, feel lucky, to have met Lauren along the way, and now I feel blessed that I know you too. I am so glad we kettlebell together! Wow, thank you everyone! I am so glad everyone liked the story and found it inspiring! @Angela thank you so much! I enjoy working out with you and look forward to getting to know you better. I am truely touched by how many people were inspired by my story. Thank you all! Wow thank you everyone! I am truely inspired by all of your comments. @ Angela I really enjoy working out with you and look forward getting to know you better. I am so glad so many of you can relate! Thank you all! Great story and inspiration - thankyou! What an inspiring story! My Michigan personal trainers have really helped me lose my baby weight and helped me to live a healthier life. I love working out with my kettlebells. Hey, that's an amazing story. Well done. "Just because you are someone you may not be proud of today, does not mean you have to be that person tomorrow" - love how you put that. It is never too late to start the journey. I find when you stop thinking "oh next week I'll start it" you start to really find your groove. This is really an inspiring story! You can do this due to you mentally strength. Thanks for sharing your personal experience. I think all women must learn from this story and start to workout on their body. So so inspirational! A friend of mine also became a fitness model and I couldn't believe her transformation.